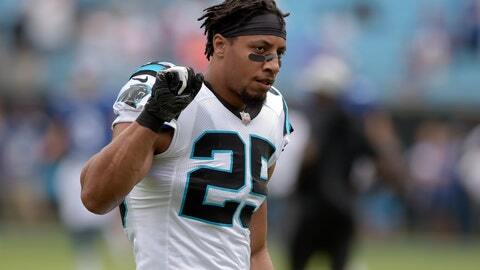 CHARLOTTE, N.C. (AP) — Eric Reid called his return to the NFL on Sunday “bittersweet,” saying it still hurts that his friend Colin Kaepernick has been “robbed” of his dream to play again in the NFL. While the safety is back in the league playing for the Panthers, Kaepernick remains a free agent. Kaepernick filed a grievance against the league in October of 2017 alleging teams have conspired to keep him out of the league because of his decision to protest racial and social injustice by kneeling during the national anthem. “Any athlete in the NFL knows how hard you have to work to get here — and his career has been cut short,” Reid said following Carolina’s 33-31 win over the New York Giants. Reid, who was signed as a free agent by the Panthers on Sept. 27, continued his tradition of kneeling during the anthem before Sunday’s game. None of Reid’s new Carolina teammates joined him or stood near him at midfield. He became the first Panthers player ever to kneel during the national anthem, and did so under first-year owner David Tepper. With a large American flag in the middle of the field, Reid went to his right knee as the “The Star-Spangled Banner” was sung by Marc Martel. After the game Reid wore a shirt that read “Know your rights” and listed 10 points. Reid added that more needs to be done to prevent racial and social injustice. “We have made baby steps , but people try to give crumbs but present them as cakes,” Reid said. Kaepernick tweeted his support of Reid and other protesters on Sunday. Reid made his return to the NFL four months after filing a grievance against the NFL alleging teams colluded against signing him during free agency after he knelt alongside Kaepernick, his former teammate in San Francisco.